At WBC Bags For Life, we have designed and produced some fantastic bags over the years, however it’s always nice to make bags for a cause that’s close to our hearts. With the recent celebrations of Australia Day on the 26th January and the upcoming International Women’s Day on the 8th March, there’s plenty to celebrate. Over the years, we have sponsored four Australian’s to work here at WBC with us. Three of those have now been with us over 10 years. Our love affair with Australia doesn’t stop there. We’ve had over 50 members of our staff work with us over the years. In celebration of the upcoming International Women’ Day, we’re sharing stories of our work in India. In 2015, along with our Indian partners, we launched a social business venture called The Cocobagh Project. Based in West Bengal, the project creates training and employment opportunities to widowed women who have been marginalised within their community. Our goal is to support these women by providing them with the skills needed for employment and basic finances so they can send their children to school. Our partnership is unique because together we own and control every part of the bag making process; every step carefully managed and quality controlled – ensuring you have full knowledge of the supply chain of where your bags have come from. We have been extremely lucky to work with Somerset House over the years. 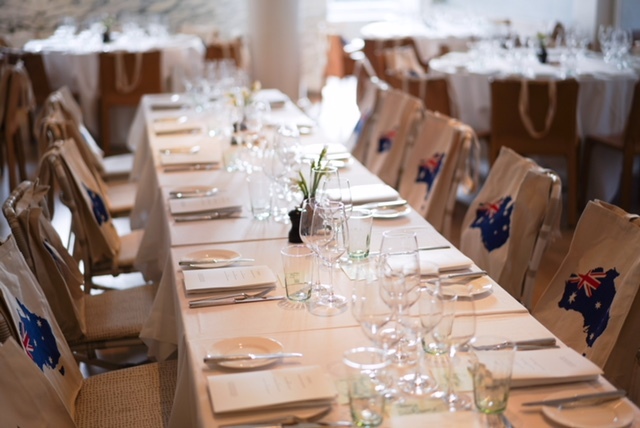 Most recently we designed and produced some fabulous tote bags for the Australian Women’s Club lunch at Spring Restaurant at Somerset House. Made from natural canvas, the tote bags were printed here in the UK using our Express service.